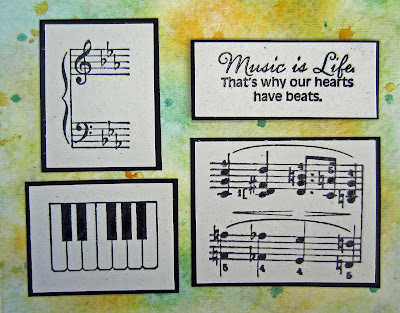 I have been diligently experimenting with Mixed Media, using lots of new (to me) tools and art supplies. This one, measuring 6" x 6", is the first one I call "completed". I'd love to hear any feedback you have for me! Good or bad. 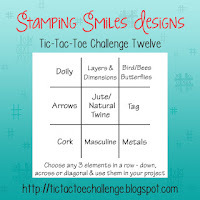 I've got a multi-faceted treat for you with this post! I will show you two ways of doing one technique, giving you a different look with each option. 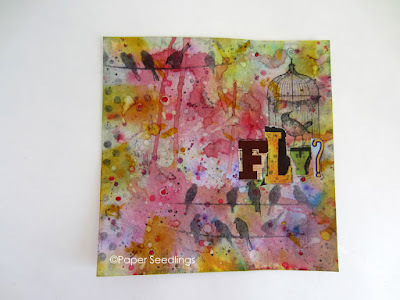 Then we will explore a wet-on-wet background technique. And I will give you a detailed tutorial for everything! 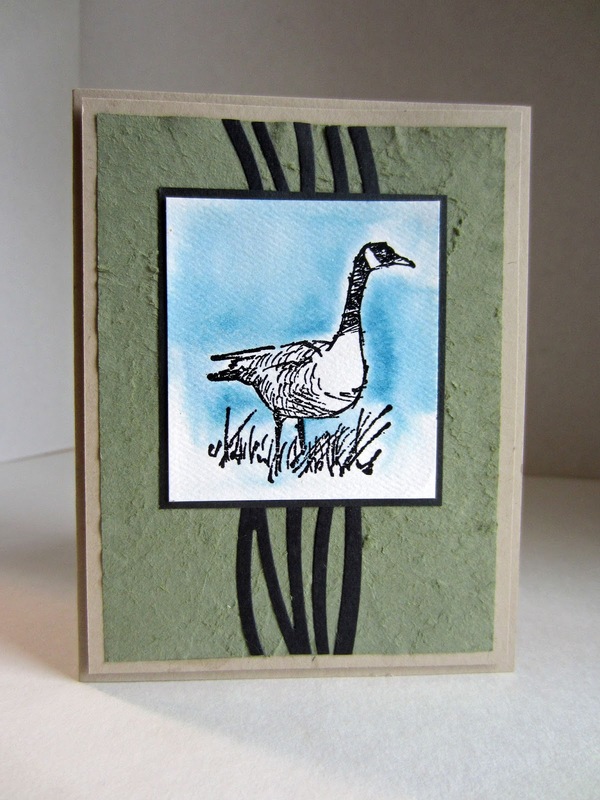 A very masculine-looking card, this Faux Suede Goose is perfect for Father's Day. The Faux Suede Technique is an oldie but a goodie and lends itself to a perfect backdrop for this majesterial Canada goose. The following photo depicts the first option of doing this technique. 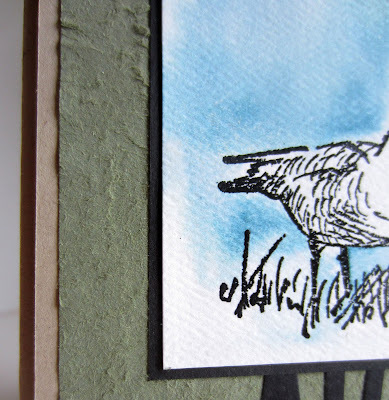 It gives a more even, flatter background piece with less character than the second way I will show you how to do it. After creating the first sample, I decided I wanted to show it the second way, but didn't go so far as to complete the entire card, just enough to show the difference. 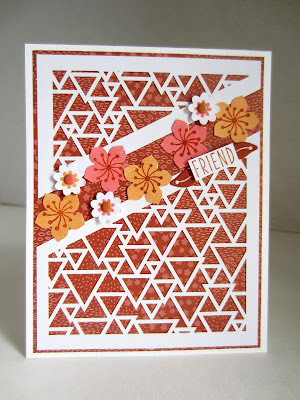 Can you see that the second option has much more character and dimension? Then, this is a close-up view of the wet-on-wet technique that we will be exploring in the tutorial. 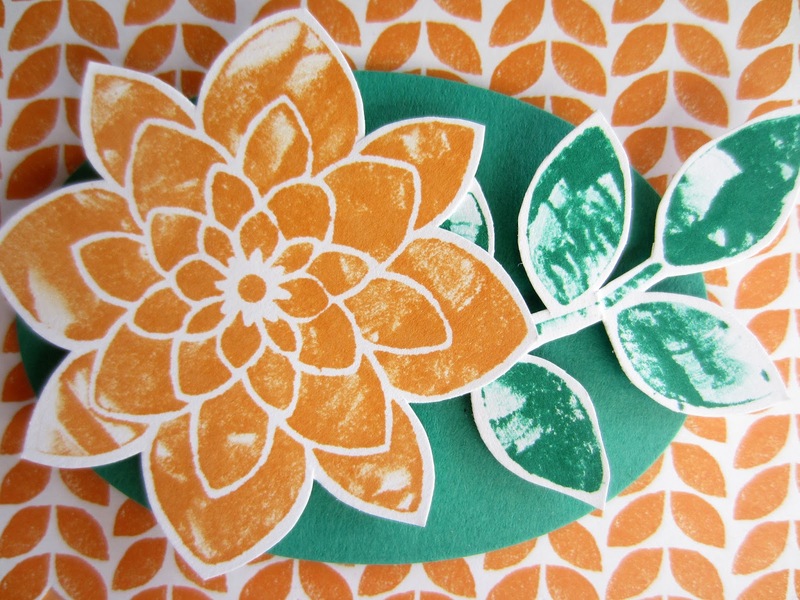 OPTION 1: Take a 3 3/4" x 5" piece of Always Artichoke cardstock in your hand and run along all the edges with a bone folder like you are curling ribbon many many times. You are breaking the fibers within the paper. Just be careful that you don't tear the paper in the process. 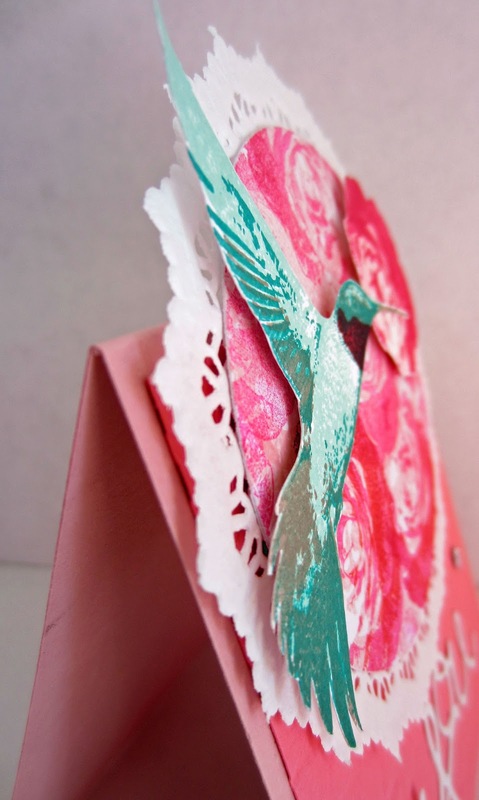 As one of the corners starts to separate, gently try to tear apart the layers of paper. If you get resistance, don't force it; just continue with the bone folder. On all the edges and corners. This can take several minutes. Keep trying to separate the paper layers until you finally succeed. 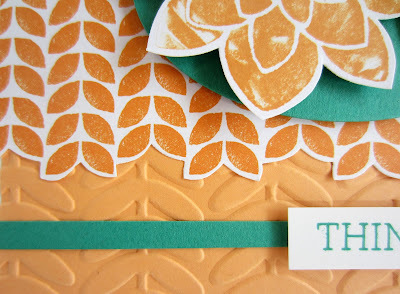 If you are lucky, you will have two pieces of faux suede paper to work with! 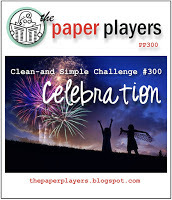 OPTION 2: Crumple the paper in your hands several times. That will start the fiber-breaking process. Continue with the bone folder. The end result will be a faux suede with a pleasing texture, compared to the smoother one without the crumpling. Cut the long decorative piece from black cardstock using the Swirly Scribbles Thinlits (page 194 of the new Annual Catalog). Adhere it running down the center of the faux suede piece you just created. Snip off the excess ends. 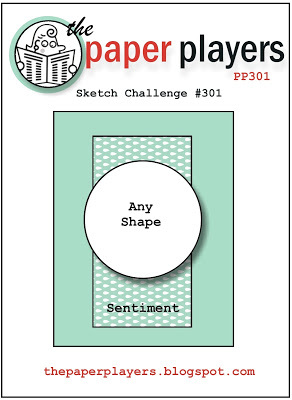 Attach this piece to a 4" x 5 1/4" piece of Crumb Cake cardstock. 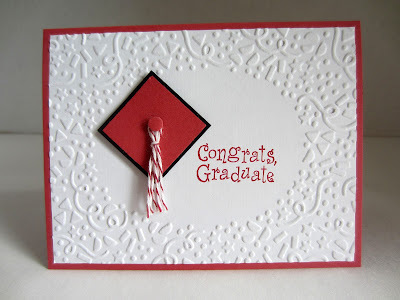 Use a few Stampin' Dimensionals to attach this to the card base. 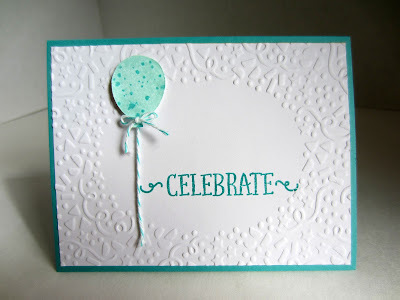 Rub the Embossing Buddy well over a 2 1/3" x 2 3/4" piece of watercolor paper. 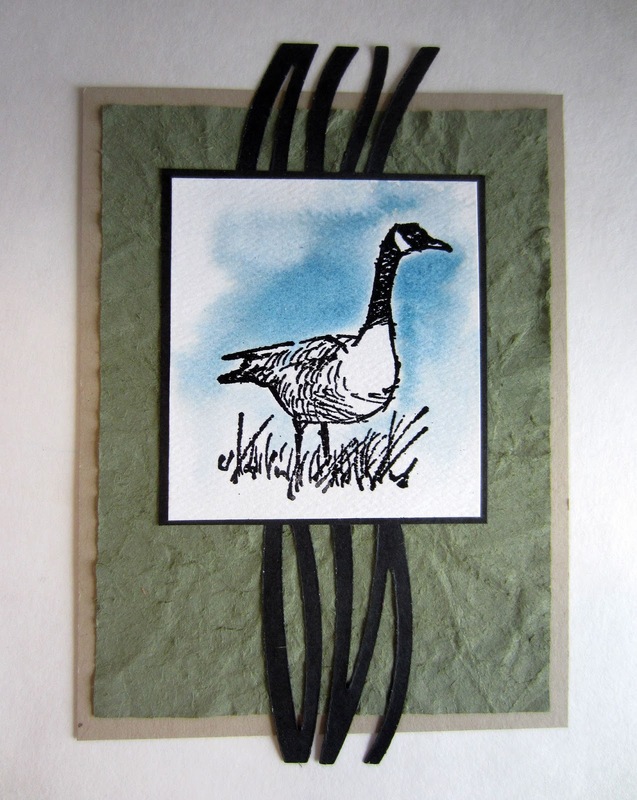 Stamp the goose in the center with VersaMark ink. At the Heat Station, cover the stamped image with Black Embossing Powder, tapping the excess powder back into its container. 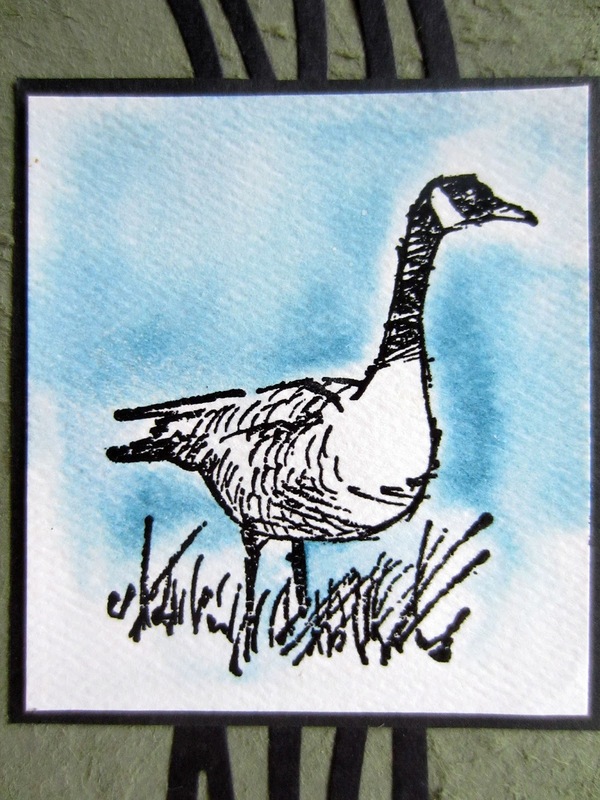 Use the Heat Tool to emboss the goose. Make sure the entire image is shiny and set. With an Aqua Painter, wet the area outside the goose well with water. Using the tip of the Aqua Painter, pick up a bit of the Marina Mist Reinker and drop it into the wet area. 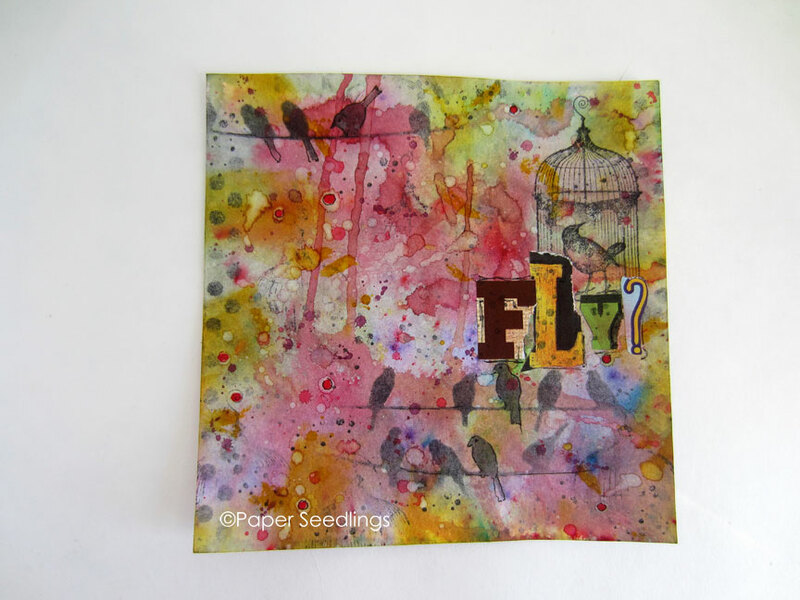 Use the Aqua Painter to move the ink around until you are pleased with the look. Letting it sit for any amount of time in one place will result in a dark spot. 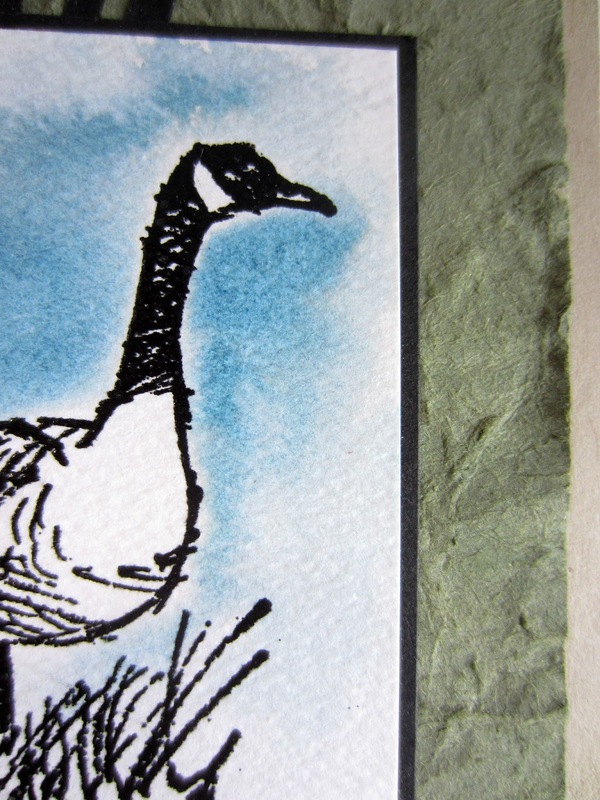 Because there is a separation in the feathers on the back of the goose, some of the ink may enter the goose image. If you catch it in time, dab the runaway ink with a tissue. You can use the Heat Tool to hurry along the drying process. 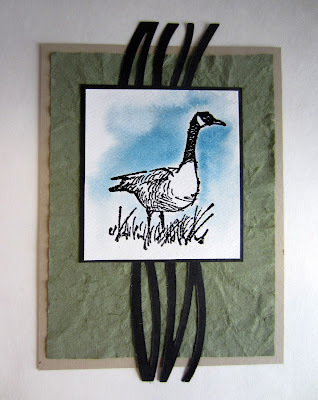 Adhere the finished goose to a 2 5/8" x 2 7/8" piece of Basic Black cardstock, then adhere this piece over the black wavy piece. 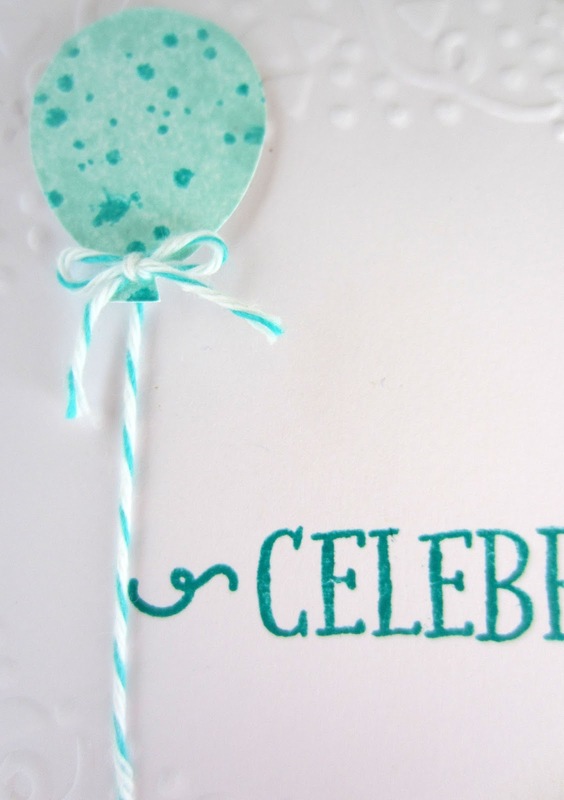 Stamp inside the card chosen sentiment in black. 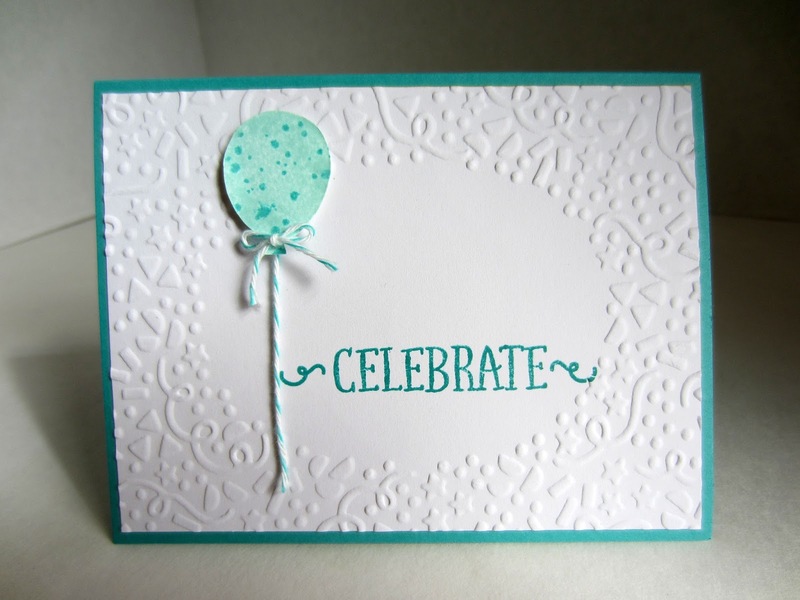 My card sports "Happy Father's Day". 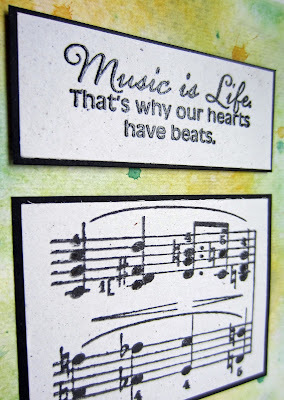 Yesterday we were fortunate to be able to attend the Senior Recital of Rachel, a very talented young woman. 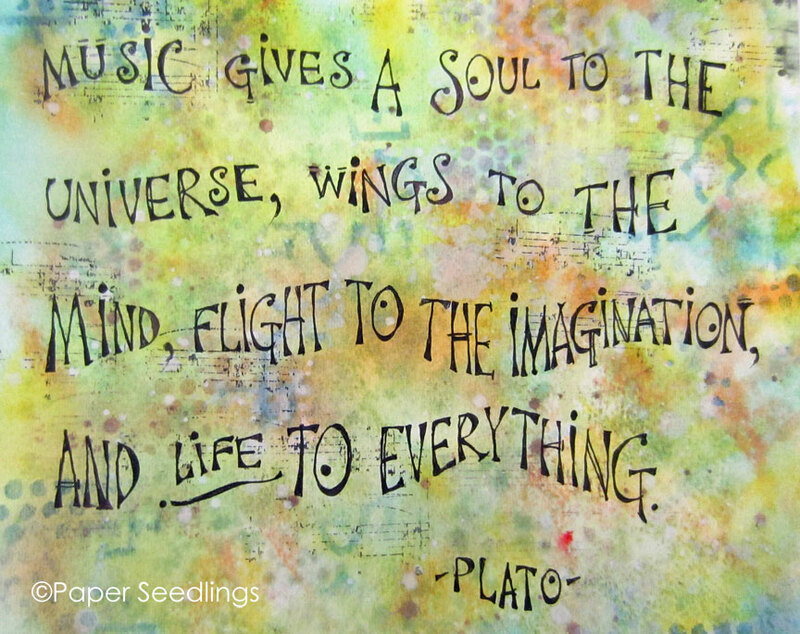 She will be heading off to the University in fall for an intensive study in performance music, namely on the piano. 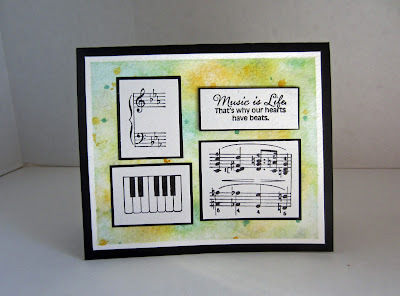 During her Senior Recital, she performed a selection of music with pieces by noted -- and tough -- composers like Debussy, Mozart, Liszt and Prokofiev. Her performances were wonderful and very moving! 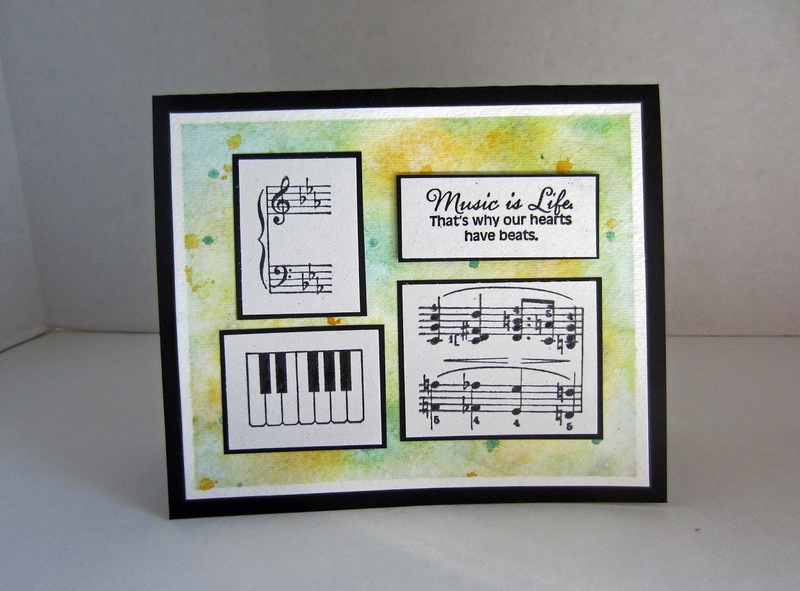 All of the stamping on the card was done in flat black ink save the sentiment, which, since it was so profound, I presented as an embossed image. The background of the card is created with mixed media on 140-pound coldpress watercolor paper in her high school colors. Congratulations to Rachel! 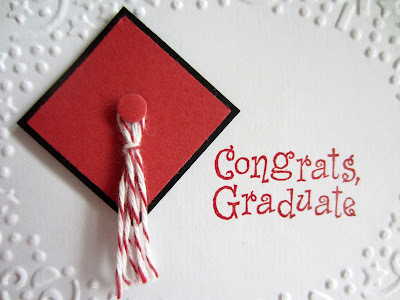 And wishing you the best of luck and happiness in your promisingly bright future! 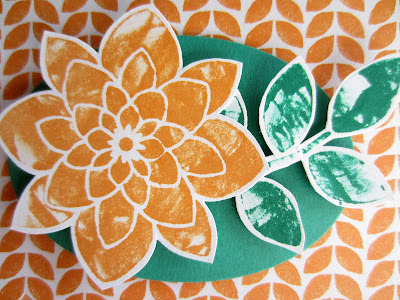 As I'd previously noted in this post, I was not a big fan of the most recent Paper Pumpkin kit. 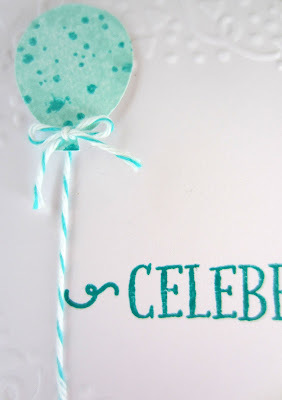 I used the trellis-shaped diecut piece to create the koala with balloon birthday card. Not to omit the triangle-shaped piece, I proceeded to march to my own drummer once again. 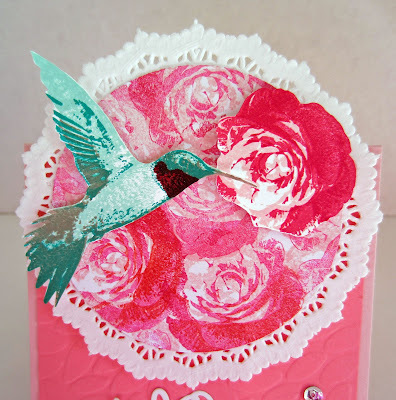 This time I created a card with a much more feminine feel. I must note that, rather than keep the diecut piece together, I cut it apart so I had a design from the DSP showing in the space that otherwise would have been pure white, in addition to it appearing underneath the lattice design. 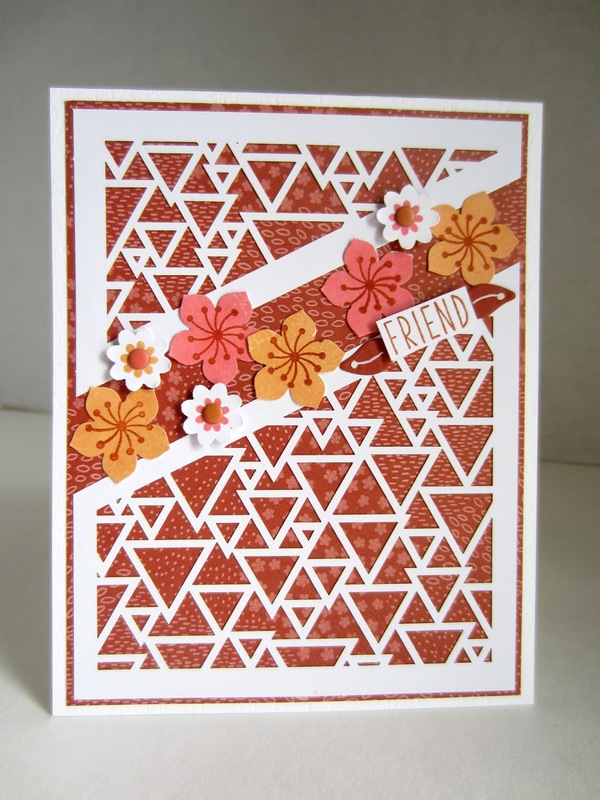 For this card, I tipped the triangles upside down, and overlaid the triangles on top of a piece of DSP with a subtle tone-on-tone coloring. To introduce two of of the new In Colors, I incorporated Flirty Flamingo and Peekaboo Peach in my flowers. 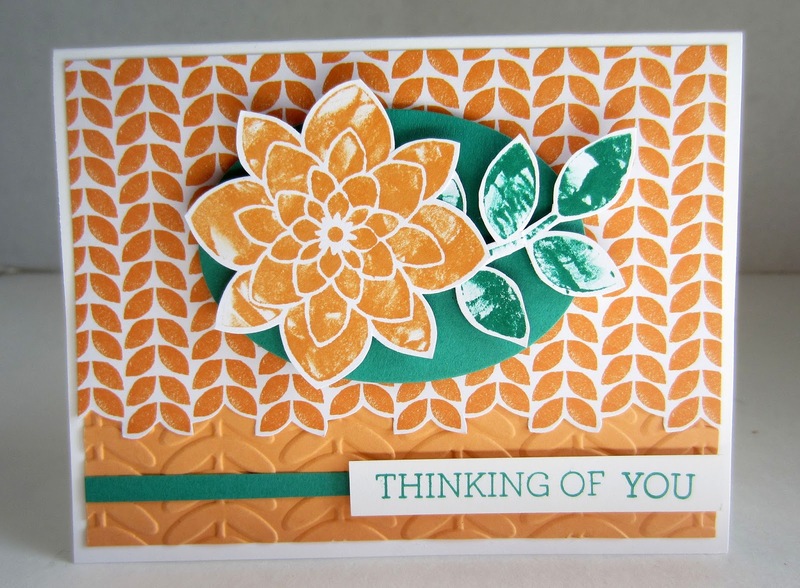 The two colors coordinated surprisingly well with an old favorite, Cajun Craze. 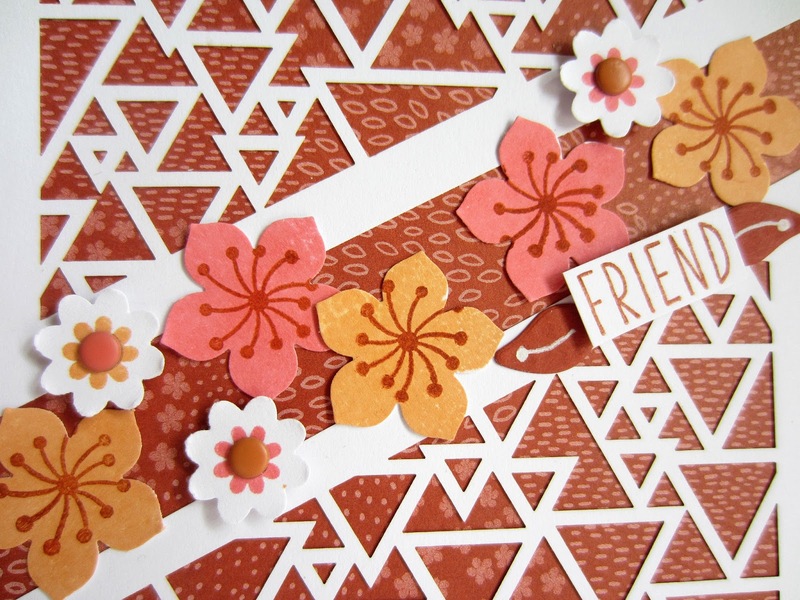 The word "friend" came from the Paper Pumpkin set and was stamped in Cajun Craze. To echo the centers of the larger flowers, I used a white gel pen on the leaves on either side of the word in a similar swirl-with-dot design. 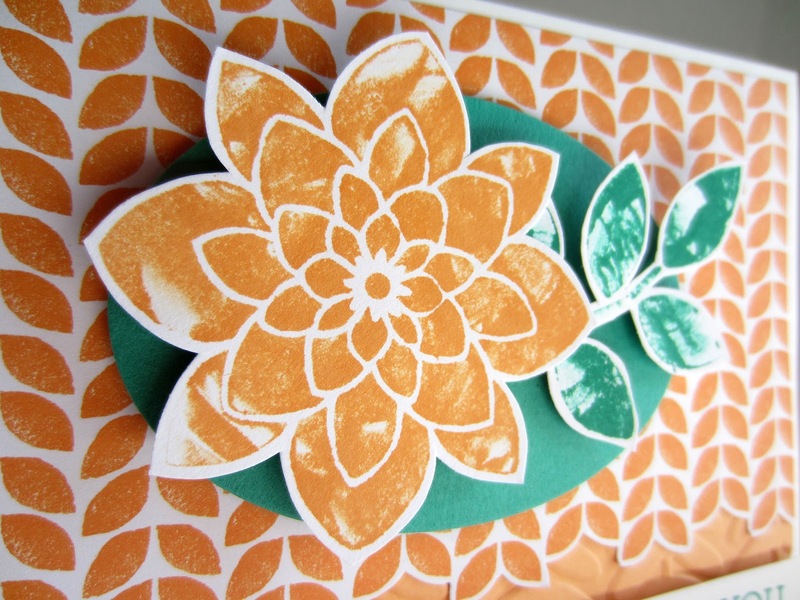 I have been seeing lots and lots of alternative options for using the components of this Paper Pumpkin kit on Pinterest and on people's blogs. Kudos to those of you who have taken these cute components and run on your own path to come up with darling creations that are all your own! 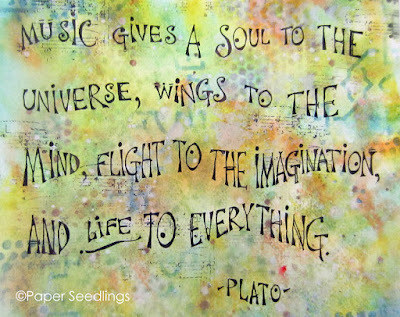 That's what creativity is all about. Eh? The date, June 2, 1973, was a very special one for me. You see, my husband, Pat, and I were married 43 years ago on that date. As always, I wanted to create a very special anniversary card for him. 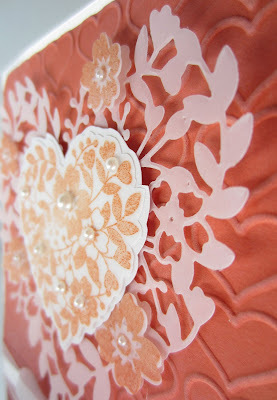 I loved the romantic combination of the Bloomin' Heart Thinlits and the Happy Heart embossing folder. I tried several different papers and prints for the large heart. Being that the color palette of our long-ago wedding was orange and white (remember, it was the 70s! ), I opted for that same color combo for my card for Pat. I ended up using Vellum Cardstock for the large heart. It was beautiful, but somewhat plain and unadorned and unfinished-looking. It took me several days of trial and error to finally come up with my end result. 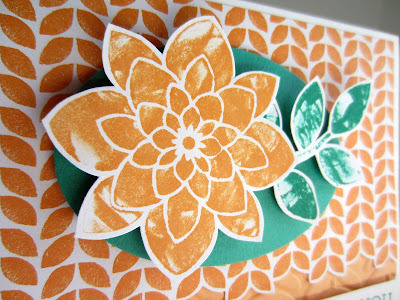 For the focal point, I stamped the little coordinating flowers in Tangerine Tango onto the Vellum Cardstock, then proceeded to cut them out with the Framelits. I adhered them to their spots on the large heart, but they still seemed unfinished. Linda, just let it go for now. The large heart was begging for something more. But what? 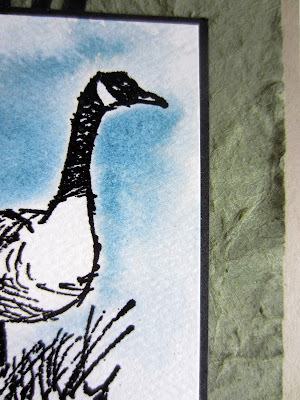 -- onto more of the Vellum Cardstock. 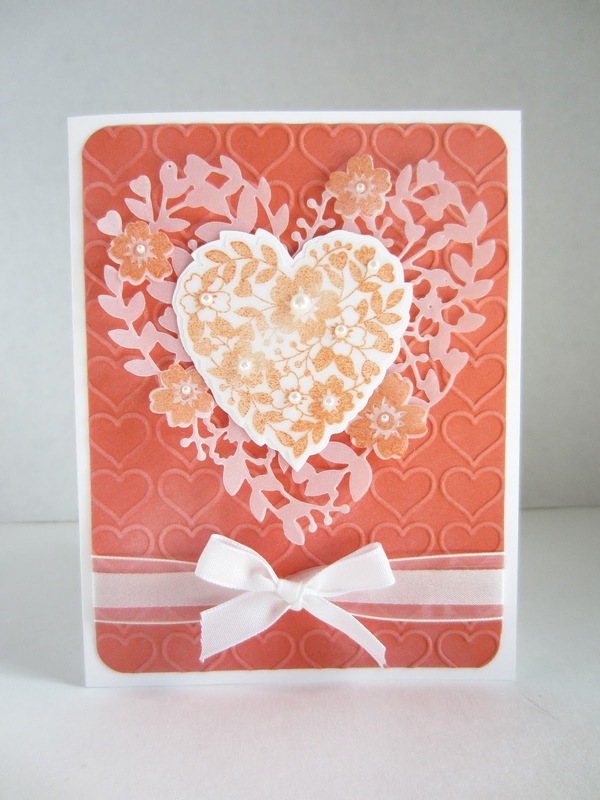 There was not a matching Framelit to cut out this heart, so I fussy cut the edges. When I laid that heart atop the large heart, it blended in way too much. 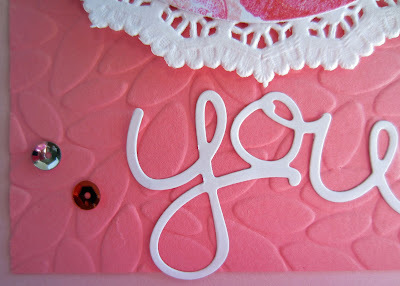 The fix for that was to adhere the fussy cut heart to a scrap of Whisper White cardstock. 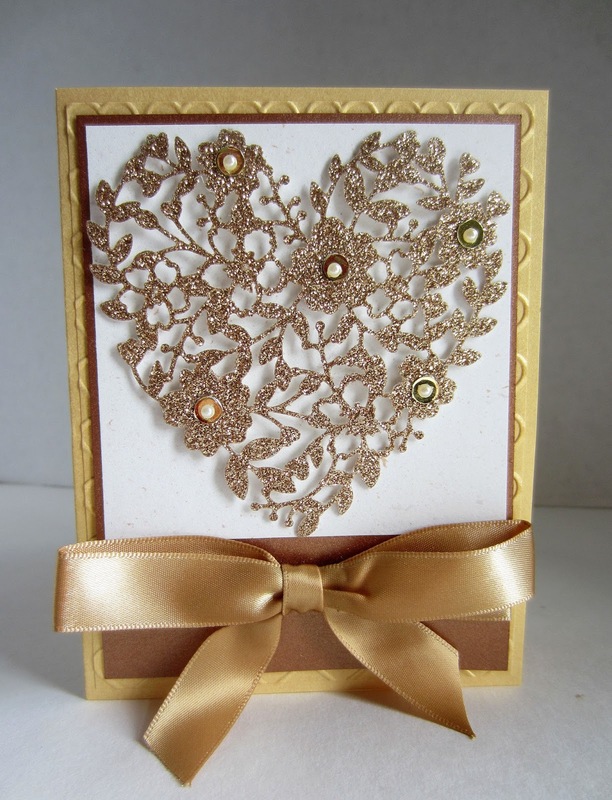 I was careful in attaching the vellum heart to the cardstock and did it with three Glue Dots placed under each of the large flowers. 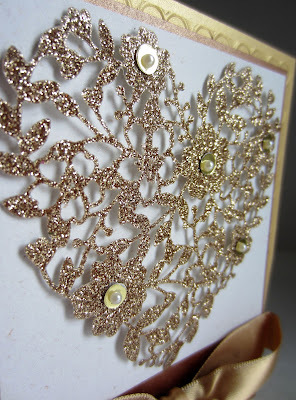 It was easy to cover up the presence of the Glue Dots with strategically placed Basic Pearls. 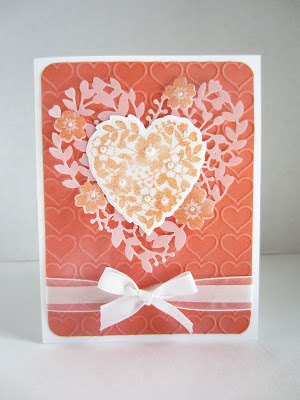 I then fussy cut the cardstock around the vellum heart, leaving a small white border. I simply adhered this heart to the center of the large heart, giving it the appearance of a big fluffy old-fashioned Valentine. 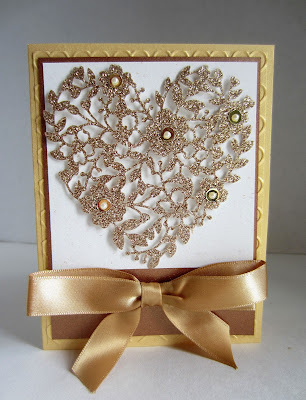 To continue the pearly effect, I added pearls to the four flowers that showed at the edges of the large heart. 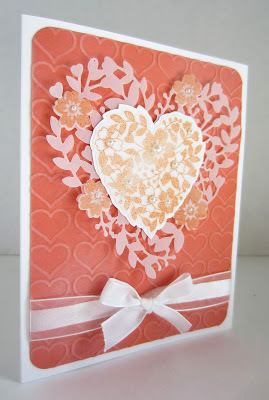 When I embossed the Tangerine Tango cardstock with the Happy Hearts, I did not like the stark look of the hearts. 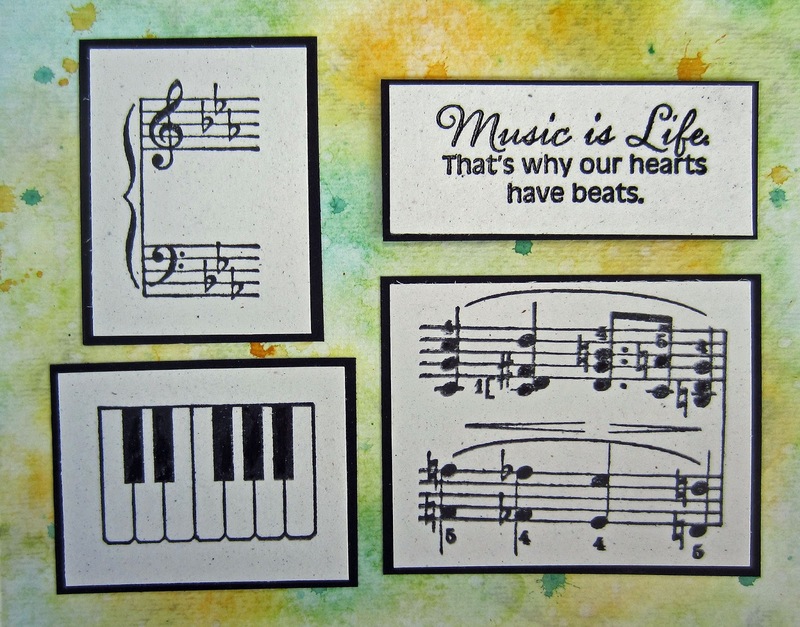 After debating how to soften the hearts background, I finally hit upon gently sponging with white pigment ink over the raised hearts. I was very pleased with these results, because it reminded me a bit of the bridesmaids' dresses, which were orange and white batiste over solid orange. 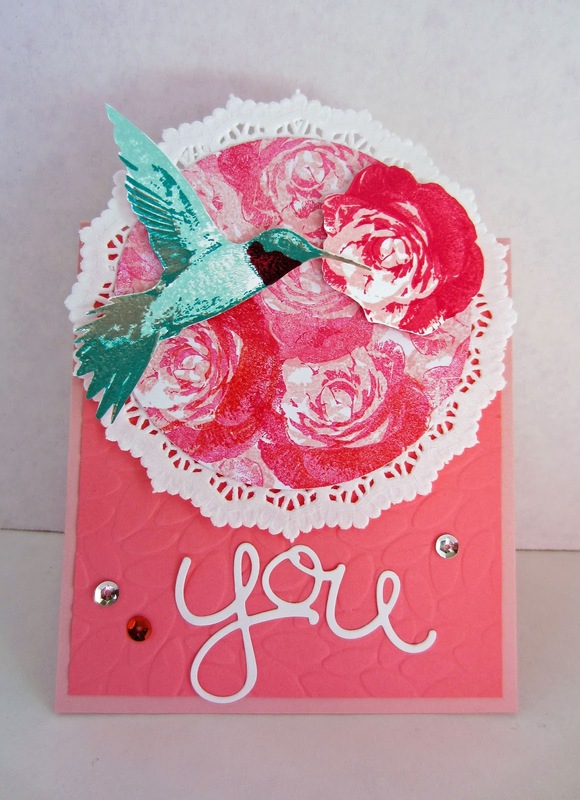 The final card has quite a lot of dimension -- and love -- in it. 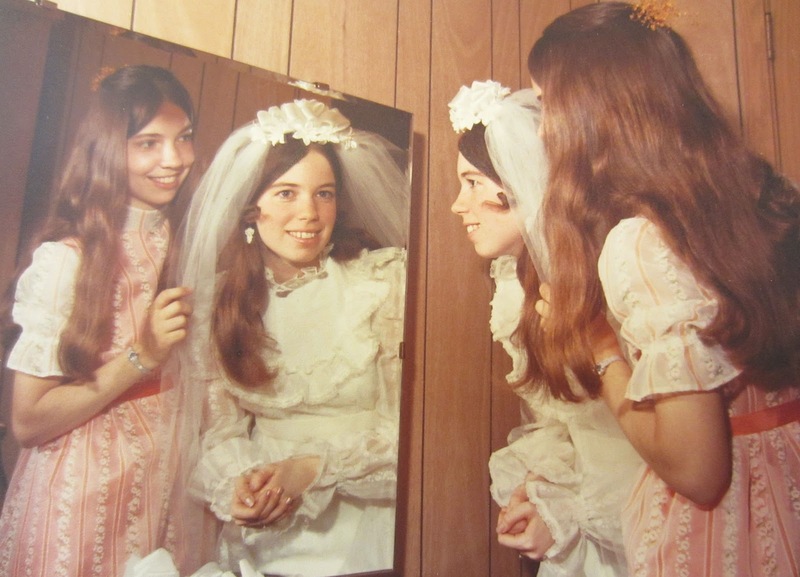 The photo below is a picture of me with my sister, Diane, before the wedding. You can see what I mean when I wrote about the card resembling the bridesmaid's dress. P.S. My mom made both my wedding dress and my veil/headpiece as well as my sister's dress.